Riding down the mountain isn’t just a means of transportation anymore. It has transcended into a way of life, and ultimately an extension of oneself. Whether you are into freeskiing, backcountry, or racing - every style is unique. These ski and snowboard manufacturers recognize not only the ingenuity in design but also the personality of riding. As a result, the brands have placed an emphasis on partnerships with local and global artists alike to create stunning topsheets that tell a story and showcase true craftsmanship. For the purpose of this award, only the topsheet design and artistry are being considered from new skis or snowboards for the 2018 and 2019 winter season; brand, performance, and specs are not being judged in this contest. We are excited to announce that after opening up this vote to our community, the 2018 Coalition Abyss ski has won our first ever Van Gogh of Snow Award! Congratulations to the Coalition Snow crew, especially the designer and artist of this winning design Lauren Bellow Okerman!! 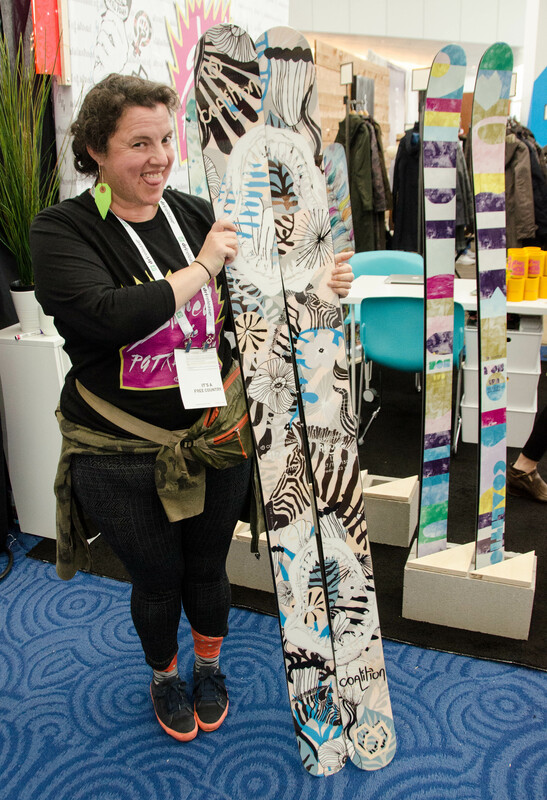 Check out the nominees from Outdoor Retailer 2018 below (and in the photo gallery), and make sure to check in next year for the next iteration of the Van Gogh of Snow Award 2019! “The daily driver for the powder hounds who aren't scared of a little hardpack." “Natalie was born and raised in Portland Oregon, where she has had a passion for creating art and exploring the outdoors since she was a child. Natalie focuses primarily on drawing and printmaking, but loves creating in all mediums. When she isn’t in the studio, she is backpacking, snow-camping or hitting the slopes, fueling her love for nature and inspiration for her art.” Follow her art portfolio on Instagram! “The on-slope ATV built for equal parts piste and powder." “A precise yet playful directional twin for all mountain adventures." “Emek graduated with a major in Art and a minor in Unemployment. In Emek's posters, psychedelic '60s imagery collides with '90s post-industrial iconography. To this collision of the organic vs. the mechanical worlds he adds humor, social commentary and fantasy. Even in the smallest details there are messages.” Learn more at Emek’s website. “Artist/Illustrator born in New York, but now living in the west. I couldn't stop making art if I tried! It was a gift given, and something I'm very grateful for. I try to make it a part of everything I do.” Follow Marinna's journey on her website. "A ski that’s not afraid to push back." "Lauren Bellow Okerman is not only the Creative Director at Coalition Snow but also operates under the name of Folklaur Studio. According to her studio description, 'The studio represents a crossroads of creative ventures in architecture, art and design, where the mission remains loyal to innovative and thought-provoking work. Folklaur embraces collaboration, exploration and innovation.'" Learn more about her by checking our her website! 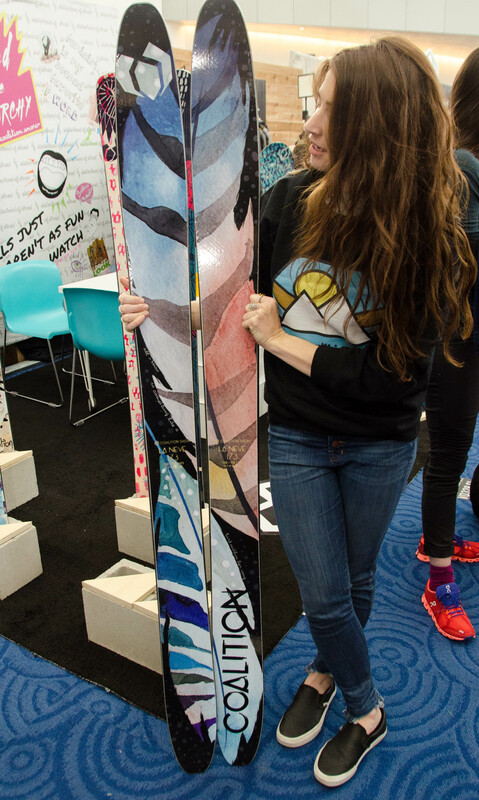 "A backcountry ski that'll have your back from the summit to the tailgate." 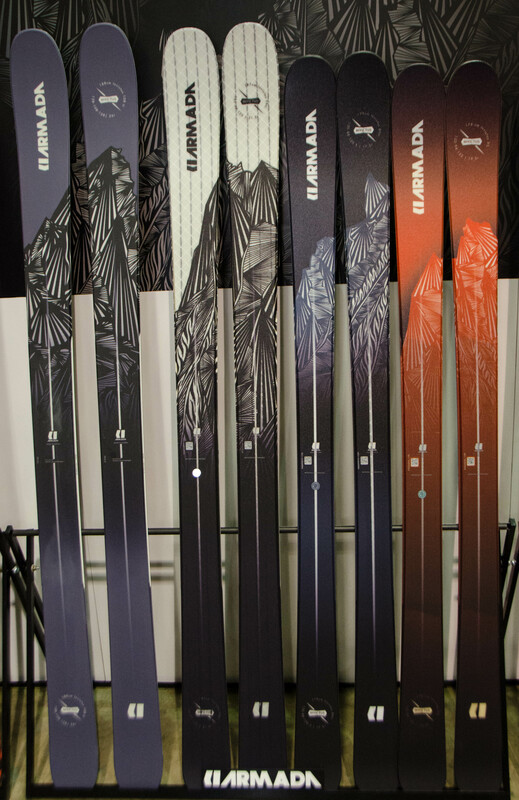 "Hard-charging directional skis built for speed, stability and power." “My life is about creating, being outside and spending time with my dog. My work is about process. My time is spent melding this together in and out of the studio. I put in the work and the hours needed to get good results. It’s the minute details that keep me going until a job is done. I paint. I draw. I photograph. I recreate. I utilize my knowledge in all of these areas when approaching a project in order to achieve the best result.” Check out more of his work by checking out his website. “Iuna Tinta is a Swiss artist working in Berlin, Germany. Iuna Tinta’s modern mountainscapes and native iconography are influenced by numerous years in Central America and the Pacific Northwest coast. However, it is her own roots, the traditional folk art and the Swiss landscapes, that has shaped her artistic style the most.” Check out her portfolio for more. "Serious shred stick for smaller riders." “The bright colorways and bold textures of UK artist RP Robert’s mountain landscape paintings jump off the canvas and immediately attract your eyes to their rich hues and striking mountain features. 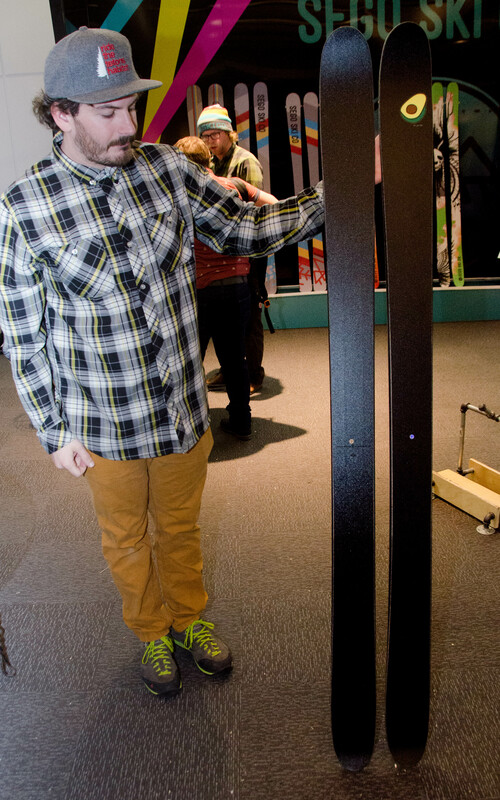 One look at RP’s art and his signature style and we knew he’d make the perfect Jones snowboard graphic artist. His art captures the essence of the mountains we cherish with a color palette that pops hard, yet maintains some natural subtleties.” Check out his website for more. “Humans and their environment are irrevocably interconnected. I begin by using texture and color to hint at the invisible ... emotional energy – on the canvas. Then the subject evolves, capturing and reacting to that energy and emotion - providing a glimpse of the complex and broad spectrum of form." Learn more at Travis’s website. 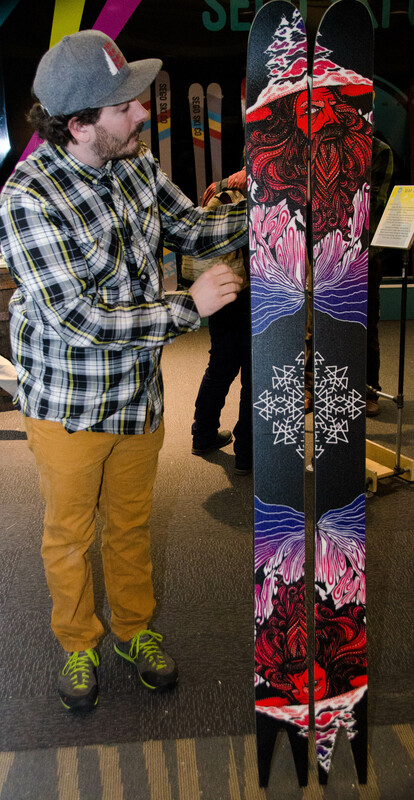 Instead of designing a topsheet per ski, Parr designed a mural to showcase progression and terrain. From urban design for park skiers to ocean waves metaphorically representing surfing in powder, Parr spent a total of about five months crafting these collection designs. Time to vote for your 2018 Van Gogh of Snow pick! There can only be one winner...who will it be? Voting will be open to the public until 5 p.m. EST on February 20, 2018. We will announce the official winner from Outdoor Retailer 2018 on February 21 along with the first and second runners-up .